Jeroen shared his journey to Rotterdam's Marathon 2013 with us yesterday, giving us a detailed account about EVERYTHING (he really did go in) that went down pre and post raceday. 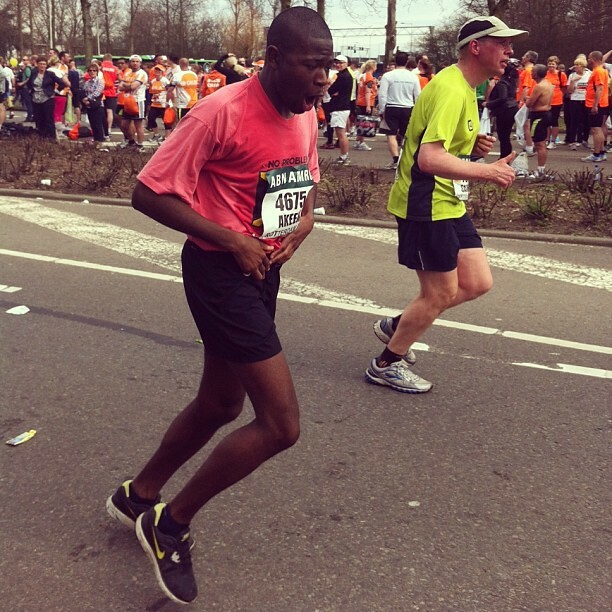 Today, his running partner, Akeem, has also kindly written a touching guest post for us: showing the true meaning of crew love, and never leaving anyone behind. This will be an unforgettable memory for them both and we were lucky enough to be there and share this experience with them! It was an emotional time for us all boi! I am a novice long distance runner, it was September of last year when I relieved my sofa, laced up and got running. My first race came in the form of the Bupa Great South Run 10k race. As I came over the finish line I got a feeling of triumph marinated with agony and it was a feeling that was out of my control but made me feel free and like a champion all at once. I knew I had to have that feeling again. My pursuit of this feeling led me to the start line of my first ever marathon in Rotterdam via Paris for a hilly half-marathon. 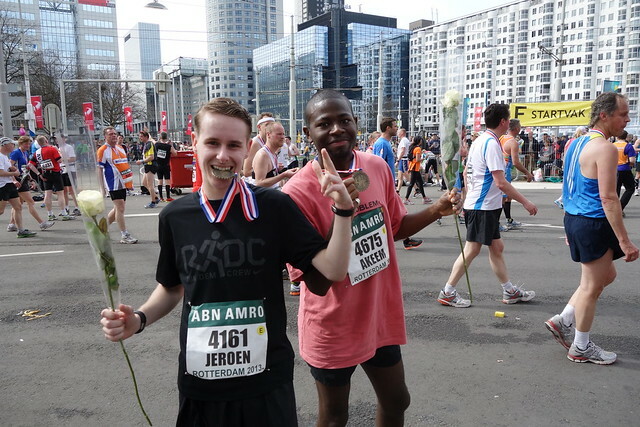 As part a the Run Dem Crew running collective I ran alongside Jeroen my fellow crew member. Wearing pink and the colours of my mothers home nation I was kitted out, ready to go and strapped with my all important energy gels. We took off buoyed by adrenaline and the determination to come over the line in "anything" under 4 hours. The flatness of Rotterdam was kind to us and I felt ok with the pace. At around 10km I struggled to keep up with Jeroen through the water station. I lost him briefly and feared the worst as he was the one keeping track of our pace and knew when to take the energy gels. His instruction and guidance was key. He could have easily took his foot off the gas and slowed down for me but he kept on and that motivated me to catch him. I sat on his shoulder for about 3km as I didn't feel the need to kill myself when he was still in sight. I pushed through and joined him at our pace that had us on course for our initial target of a 3:53 finish. 5km later and and 7km to go Jeroen experienced some pains in his thighs and had to stop. He told me to go on and leave him. I told him we start together we finish together. We walked and jogged in stops and starts up until the next water station. This and a word in his ear about a kiss from his girl waiting for him gave him some turbo and I found my self on his shoulder again for a brief spell. The pain continued and we had to stop again. He did some stretches but his knee was throbbing so we took it very slow and carried on together. We approached the finish line and joy and relief poured out of us both. Thats when my hamstring turned to stone and cramped up on me. I felt it earlier but thought it would hold out until the end. I griped my hamstring and hit the deck. Randomly an English runner came over and helped me. He stretched out the hamstring and then with help from Jeroen lifted me to my feet. I heard the volume of the crowd erupt and scream my name, willing me over the line. Through the grimace of pain i flashed a smile and yelled back "danke wel" to the Rotterdam crowd. Men, women young and old all urging me on. It was surreal. It was then that I realised this particular experience surpassed that feeling I got after my first run. 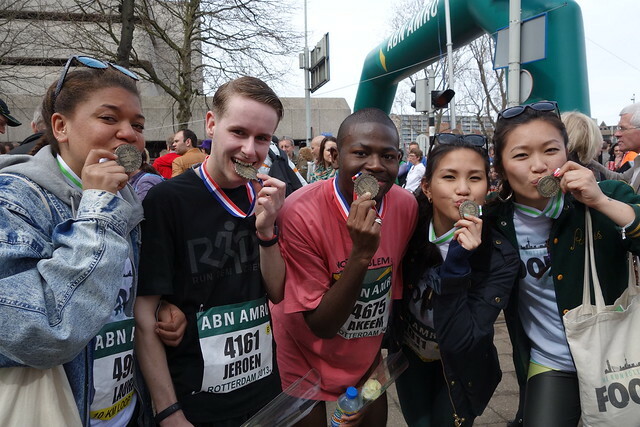 Jeroen and I completed the race. Time was irrelevant. The love, the emotion, the human instinct the exemplification of crew love is what will be remembered and live a long and prosperous life in my memory. Thank you to everyone who believed.